The bluebird has long been a symbol of cheerfulness, happiness, prosperity. It’s such a chipper, lovely little bird, and my favorite harbinger of spring. Here in Kansas, I’ve had bluebirds hopping around my birdbath and feeder since January! I just love the little flitty things! The other day, a pal popped in for a visit, carrying with her a piece of art she had appropriated from her sister’s wall. 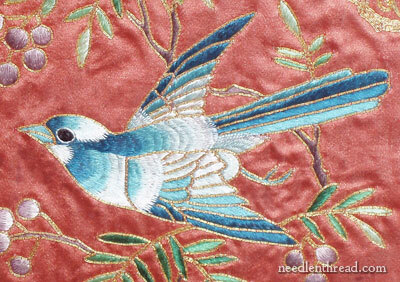 Much to my delight, it featured the bluebird – in silk and gold embroidery, Chinese style. The piece was purchased at an antique shop, and it was uniquely framed – encased in glass on both sides, so that the embroidered piece floated in the middle of the frame, and any wall behind it showed through. The frame job made it somewhat difficult to photograph, but I did my best, because I wanted to send the Bluebird of Happiness your way! 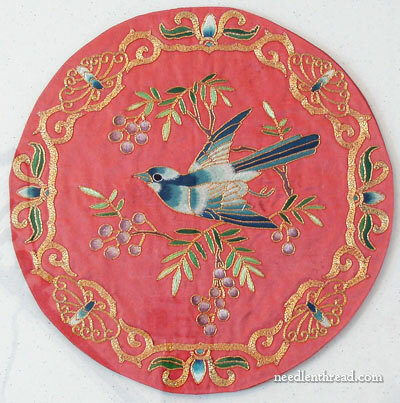 Embroidered on red silk with silk and gold threads, the bluebird occupies the center of this cheerful medallion. At first, I thought the piece might have been salvaged or cut from a larger embroidery and then finished and framed, but after looking at the front and back (the back is covered in silk, so the stitches aren’t discernible) and the edges (which are turned in and finished), and considering the unity of the whole embroidered design, I changed my mind. The stitches that make up the bluebird are delicate and tiny, and the techniques involved are long and short stitch in a sort of ‘block shading’ method (the long and short stitches are worked in even, rigid rows), satin stitch on the feathers, and double lines of tiny couched gold passing thread. I love the fact that the bird is in flight, with head lifted up. The bluebird is supposed to be an “uplifting” bird – in symbolism, it often denotes uplifted spirits (hence, happiness). Behind the bird, we find a burst of berries and leaves. 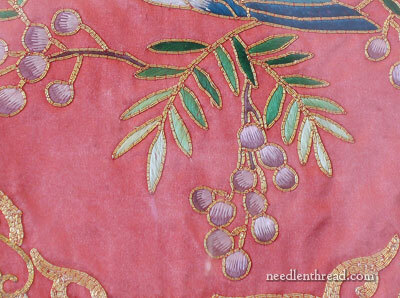 The berries are stitched in two colors of a muted pinkish-purple, in long and short stitch, and the leaves are stitched in satin stitch. 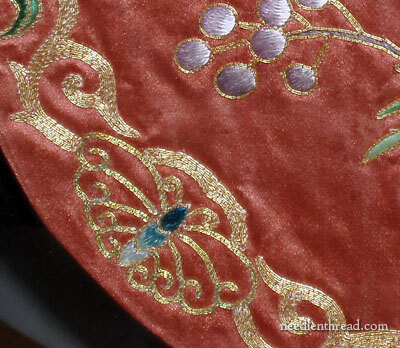 All the silk used is flat silk, so there’s a definite sheen on the stitches! And surrounding all is the tiny gold passing thread. The edge of the piece is bordered with butterflies and flowers in silk and gold, and lovely golden swashes worked in the gold passing thread. The edge contributes even more to that sense of Spring and happiness which the whole piece conveys. 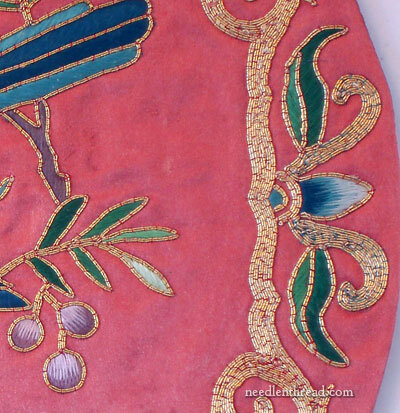 The majority of the couching of the gold throughout the piece is done in red. But you can see on the gold swashes on each side of the bud in the photo above, that the gold is couched with green instead of red. I thought that curious. It’s the case with each of the four buds on the outside edge of the design, the only places where any color besides red is used to couch the gold. Why switch to green there, I wonder? I have officially titled the piece The Bluebird of Happiness, even if the owner doesn’t know it, and I’m sending it your way to bring you good cheer! G’day Mary, this is so very, very beautiful. It is a most beautiful piece of stitching. I think the green on the gold is meant to be extra leaves on the buds and haven’t turned full green yet!?! Thank you for sharing! Every detail is beautiful! Wow! What a find. Your friend is lucky to have found this piece. It is exquisite. What a delightful piece! I love the little lilac berries and the main subject, too. Thanks for sharing! Thanks for sharing this beautiful piece, Mary. And thanks to your friend for sharing it with you!! It’s definitely cheered me up this morning! Do you know of the book The Happiness Project by Gretchen Rubin? Her book and website are wildly popular and guess what symbol she uses for happiness? Yup – the bluebird. And she grew up in Kansas City! Here is a link to her website – http://www.happiness-project.com/ and I am going to send her a link of this posting. I think she’ll love it! Have a great day! It is going to be nearly 70 in NYC today. Wow! How big is it? I’m wondering if it’s a badge that could have been sewn onto clothing or such. At any rate, it is beautiful and brought a bit of happiness to my morning. And bluebirds for real? Awesome! I’ve only seen them a few times in my entire life. Hi, Gail! Oh… darn…. I was hoping no one would ask this question, because I forgot to measure it while I had it! I think it’s about 9″ in diameter, if I had to make a guess. I tried to get some good photos of the bluebirds at my birdbath, but they never stick around once the house door opens! I have a piece of this style of embroidery as well. I hadn’t thought about it in years. As I recall, when I purchased it, I was told that the embroidery was called “blind stitching” because the young women who did the stitching eventually went blind from the close work. I don’t if that’s a true literal statement, but I certainly know that after working close on my stitching I certainly feel a bit “blind”. Thanks for sharing the lovely piece! Yes, I’ve heard of that, too. This piece isn’t so fine that the stitch areas can’t easily be seen. I think there are Chinese techniques that employ much finer needles, threads, etc. I know what you mean about feeling blind after a stitching stint! I’ve gotten into the habit of resting the eyes every few minutes, just by glancing around, looking at something else in the distance, etc., and it really does help! What lovely work! Thank you so much for sharing that. Loverly! I have tried to lure bluebirds for a couple of years to our backyard feeders, unsuccessfully to date. I’m still tyring though. It was really nice to receive a bluebird from you, today. Looking forward to Spring. Normally I’m not especially drawn to Chinese embroidery or embroidery with gold thread or couching but somehow I find this piece very appealing! I am going to use that butterfly on something. I don’t know what, yet, but it is so perfect in its simplicity of line. I have to use it. a very lovely piece. i especially like the open work butterflies around the edge. It is so lovely and in such wonderful shape that the gold still hasn’t lost its sheen. “Making do” with what was available, might be the reason for the green instead of red couching stitches. For a casual viewer, it probably wouldn’t be noticed. the way you blend and smooth the different shades of colour out is beautiful..and the beads just add more definition. Thank you for sharing. It really is amazing. Years ago, I used to be a teacher of Chinese, and spent quite some time in China, improving my Chinese at a university in Shanghai. We students got taken off to various places such as factories and workshops which the university people thought we’d find interesting (or which they found interesting and wanted an excuse to visit! )…one of them was a place where they did this type of embroidery. These are intended to be double sided and viewed from either side – mainly to show off the level of skill involved in its making. The round ones, like this, were sold in a special round frame that could be set on a shelf or table. I seem to remember reading once – though I could be remembering this wrong as it was maybe 30 years ago I read it – that the technique become popular in the Qing (Ch’ing) Dynasty (1644-1912), and was originally used for decorating gauzy room dividers in the homes of the wealthy elite. ES MUY AMABLE POR ENVIAR FOTOGRAFIAS DETALLADAS DE CADA PARTE DEL BORDADO. Next Next post: Stem Stitch Filling in Silk – and Decision Making!